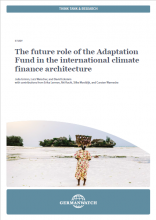 The study explores the Fund’s role in the future climate finance architecture, taking into account past and current debates in international climate negotiations. The paper also seeks to inform these debates, particularly discussions related to operating modalities, safeguards, and governance of the Adaptation Fund, which are to be decided at the 24th Conference of the Parties (COP 24) to the United Nations Framework Convention on Climate Change (UNFCCC) in Katowice, Poland, in December 2018. The main part of this paper corresponds to these three areas and aims to provide background information, as well as recommendations, for improving the Adaptation Fund’s operations and securing its future. 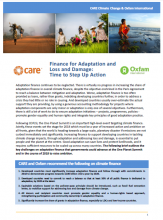 This CARE report presents, for the first time, a comprehensive analysis of the finance provided by the G7 group, as the main causers of climate change and main providers of climate finance, to developing countries for climate change adaptation and to what extent it promotes gender equality. The analysis is based on the over 16,000 projects in the OECD database supported by the G7 in 2013-2016. 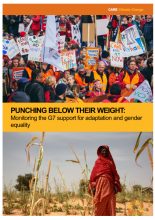 The results show that there is an urgent need to increase financial support for climate change adaptation with much stronger gender equality efforts. 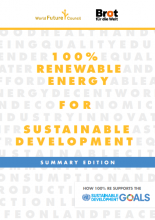 This summary of the report “100% Renweable Energy for Sustainable Development” published by Brot für die Welt and the World Future Council demonstrates how a transition to 100% RE can contribute to the achievement of the 17 Sustainable Development Goals (SDG) which should also be supported by climate finance. This discussion paper from Brot für die Welt demonstrates that climate-induced non-economic loss and damage (NELD) includes forms of damage that cannot be measured or compensated financially. 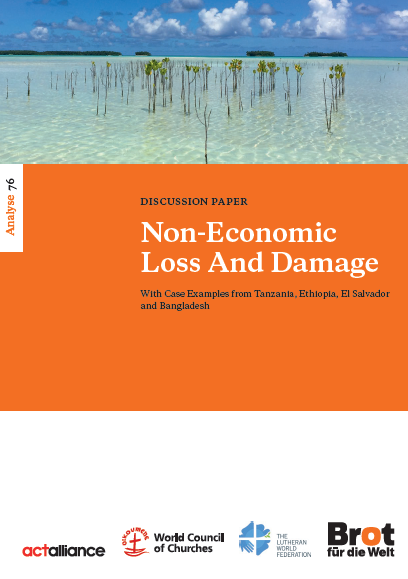 It includes loss of biodiversity and ecosystem services, land, territories, artefacts, life, health, knowledge, social cohesion, identity, and sovereignty, and it ultimately causes migration and displacement. 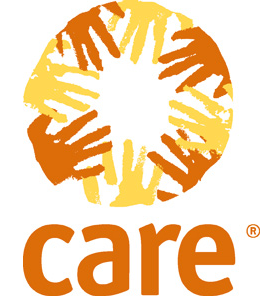 Based on examples from Tanzania, Ethiopia, El Salvador and Bangladesh, this paper describes the lessons learned regarding the community based method that enabled NELD to be identified, evaluated and registered for the presented case reports. The paper concludes with eight policy recommendations directed at WIM and stakeholders at the national level, which built on the main findings and are aimed at better understanding, addressing and minimizing NELD. 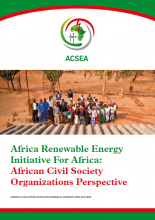 In the publication published with support from Brot für die Welt and Germanwatch, the African Coalition for Sustainable Energy and Access (ACSEA) presents African CSOs viewpoints and demands with regard to AREI and surrounding activities.